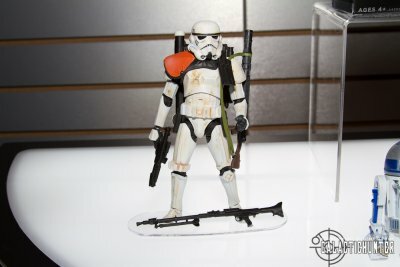 A good portion of what was previewed at San Diego Comic-Con and Celebration VI last year will never make it to U.S. pegs. The Yoda line Movie Heroes figures which included the Sandtrooper, Anakin Skywalker with Light-up Lightsaber, Battle Droid, and Boba Fett will see European release only. Apparently, sell through in Europe, particularly in Germany, has been doing really well as The Clone Wars series enters its first season there. 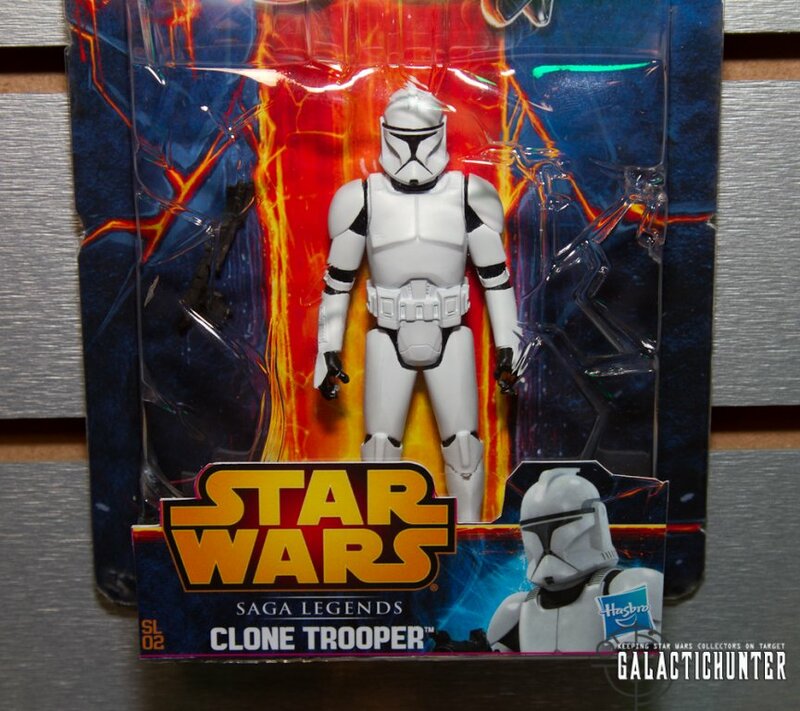 The same goes for what would be the final wave of Clone Wars animated figures, which are D.O.A. 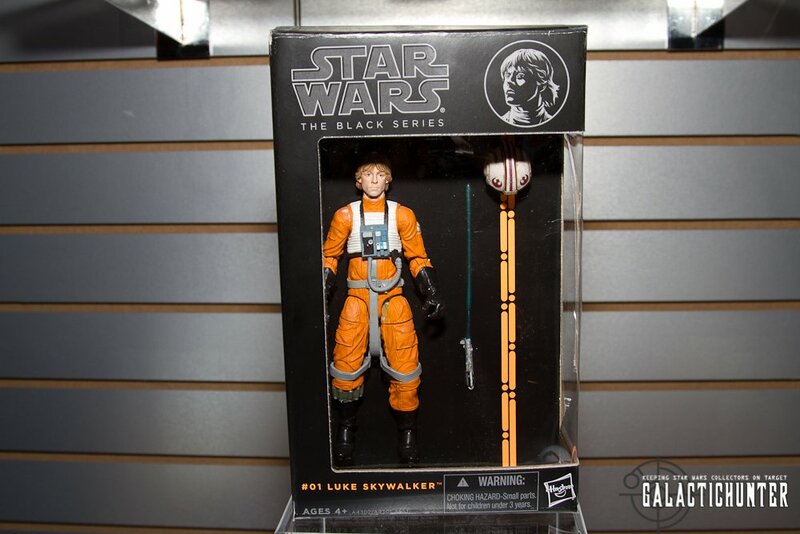 for the states in 2013 but will be distributed in Europe, according to Star Wars Brand Manager Jeff Labovitz. While the series itself will continue (at least through a reported Season 6), the animated style figures will be laid to pasture as Hasbro focuses on streamlining tooling expenses. The production costs in China have risen every year by 20%, pricing out the kid segment and forcing Hasbro to evaluate other options, including a lower cost assortment. 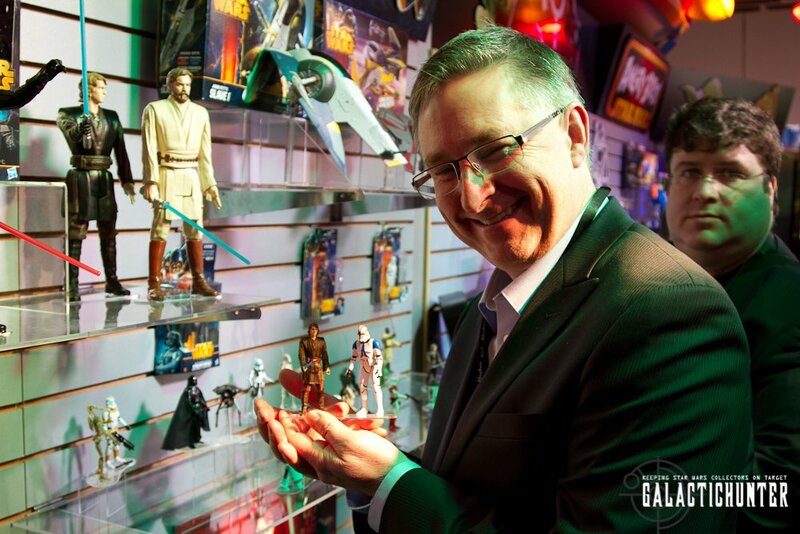 The Star Wars franchise is somewhat unique in that there is a loyal following of adult collectors who have emotional and nostalgic ties to the brand. But that nostalgia also comes with an elevated desire for more detail, articulation, paint, and accuracy that adds incremental costs to the production. Parents on a budget look at a $10-12 3.75 inch action figure and fail to see the value proposition while kids just want a cool action figure of their favorite Star Wars character and would care less about 14 points of articulation. This re-evaluation of strategy has already been in the works before the Disney thing, as seen by the 5 point of articulation figures that were released on the second half of 2012. But all the decisions with Droid Factory and shortening the cycle of the Yoda assortment clearly reflected an urgent escalation by segmenting the line and launching the "Black Series". 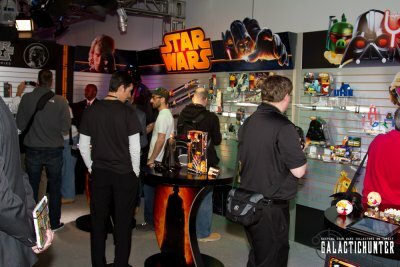 The Star Wars presentation at the Hasbro booth was fairly sparse, with almost 40 percent of the area dedicated to Angry Birds. There is no big vehicle in 2013, and there probably won't be one until the new movies come out. When asked about the possibility of a Sail Barge, Hasbro pretty much said that it lacked the emotional touchpoint of a Millennium Falcon or even an AT-AT and that past performance determines future product (see M.T.T.). Despite many in Pawtucket wanting to see a Sail Barge made, it would be a tough sell to executive management. While it's hard to project what impact and new possibilities the future films will bring, producing a Sail Barge is clearly not in the cards for the foreseeable future. In terms of other vehicle assortments, the Class I mini rigs will be on hiatus after this last wave of Yoda line vehicles and figures that were released in January and the down-scaled, lower priced Class II will continue. 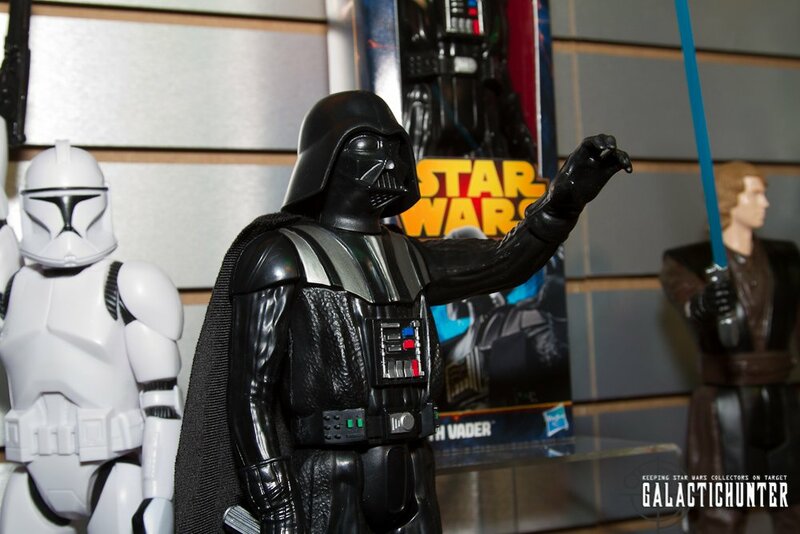 Wanting to evoke a more "premium" feel and attracting adult collectors with accurate detail, superb sculpting, and super-articulation, Hasbro will launch The Black Series this fall featuring 2 scales of figures with distinct black packaging. 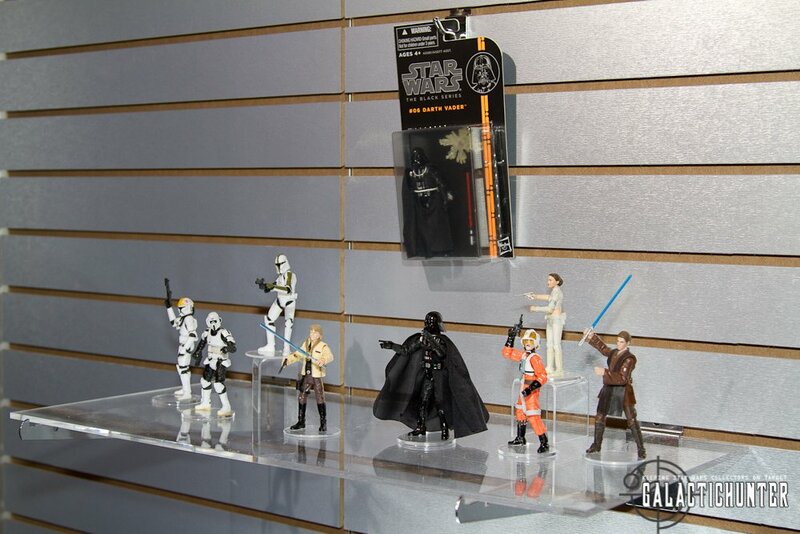 The 3.75 inch assortment figures that were originally planned for the cancelled Droid Factory include Geonosis Padme, Episode II Anakin Skywalker, a Biker Scout, Bespin Darth Vader, a brand new Ceremony Luke, and new Biggs Darklighter. Other former Droid Factory figures shown or mentioned at the presentation that will comprise of Wave 2 include Pablo Jill, Luminara Unduli, 41st Battalion Clone Trooper and Fan's Choice winner, Mara Jade. The fate of those Droid Factory Build-A-Droid figures appear to be as a part of a future multi-pack, according to Hasbro (reported by JediTempleArchives.com). The tools are made and won't be wasted, so rest assured, they'll make it out eventually. 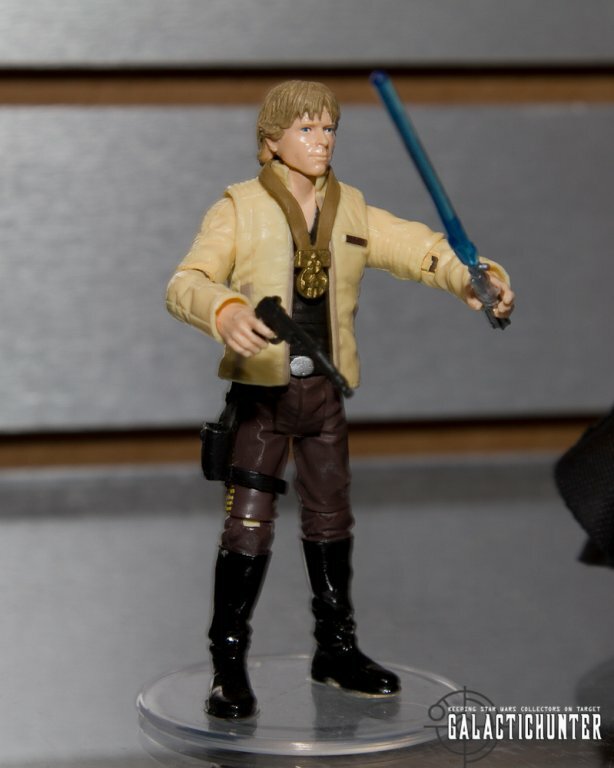 Hasbro had limited success and effort for a 6 inch scale line of figures with 2000's Power of the Jedi's Mega-Action assortment that only saw the release of 3 figures. 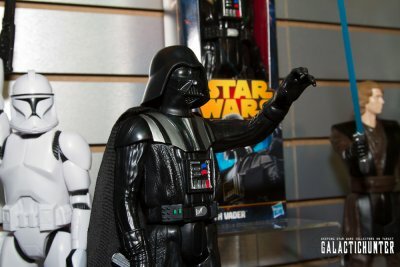 With the success of Marvel Legends, it was inevitable that Hasbro would eventually produce that scale for Star Wars that's targeted more for the adult collector. The goal is to produce key characters in iconic moments that's captured with great detail in sculpt, paint, likeness, and articulation and the results from what was shown is astounding for the first wave featuring Luke X-Wing Pilot, a Sandtrooper, Darth Maul, and R2-D2. Hasbro even recruited the expertise of Gentle Giant Studios to obtain as accurate a sculpt as possible. 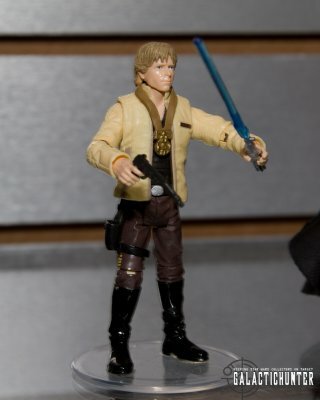 Luke's facial likeness is pretty spot on and Maul has a swappable hooded look. R2-D2 has to be one of the best of any scale with various attachments and features. They're cheap with 5 points of articulation but decent sculpts, and if you're a visitor of this website, then they're not made for most of you. Saga Legends gets re-defined for 2013 to a kid oriented line that's price accessible for parents and a gateway toy into the Saga. Saga Legends originally meant repacks or greatest hits, but this assortment features new and decent to great sculpts. When you were a kid in 1978-1983, articulation didn't matter much but you still played with your Kenner figures because imagination took care of the rest. 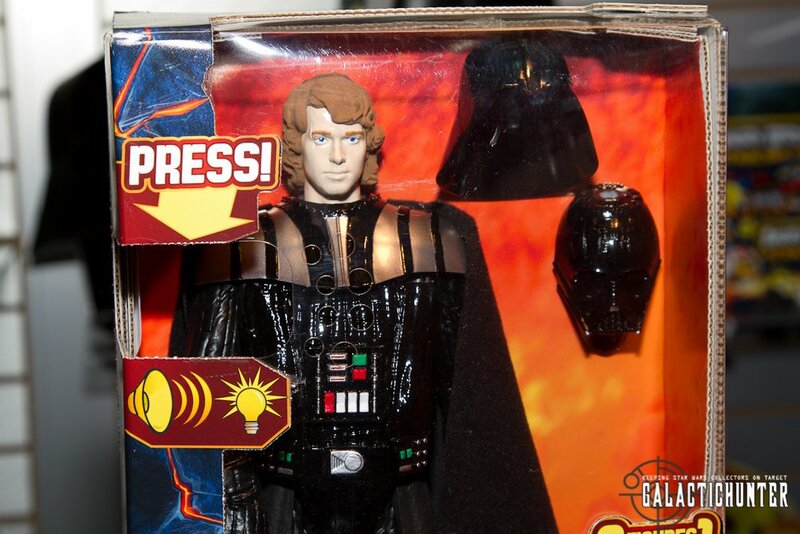 In introducing this new line, Hasbro hopes to expand that audience as we ramp up to new movies. They even used the same type of PVC plastic used on the original Kenner figures. 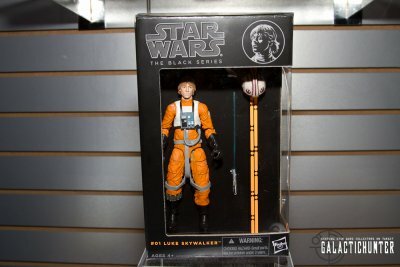 So if you end up collecting and displaying them, not only will the articulation harken back to the era, but it will feel like your old vintage action figure to the touch. The first wave has an Episode II Clone Trooper, Mace Windu, Yoda, R4-P17, and Obi-Wan Kenobi. They're packaged in the new Vader ROTS-like line look coming out in the fall. 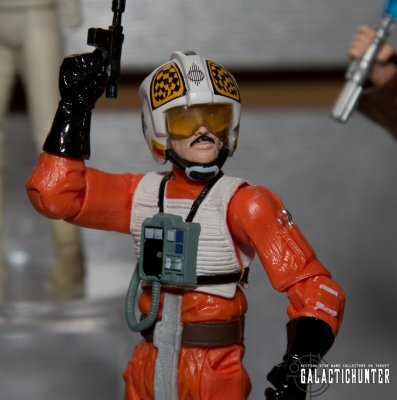 These figures can comfortably sit on a vehicle cockpit and are sort of retro, and many of you will hate that. But if you appreciate your action figures more as toys than super poseable, highly detailed figurines (and we love and appreciate both schools of thought), you will appreciate collecting these and they won't break your bank. This two pack series pairs your favorite humanoid Star Wars characters with a Droid. 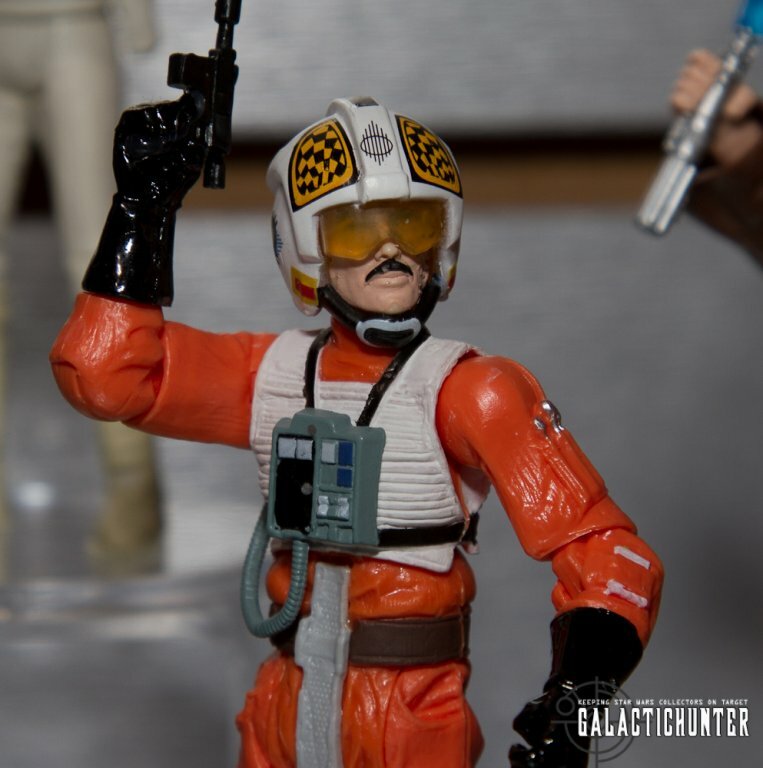 The Mission Series also features new sculpts and 5 points articulation, but they look pretty fantastic in sculpt. 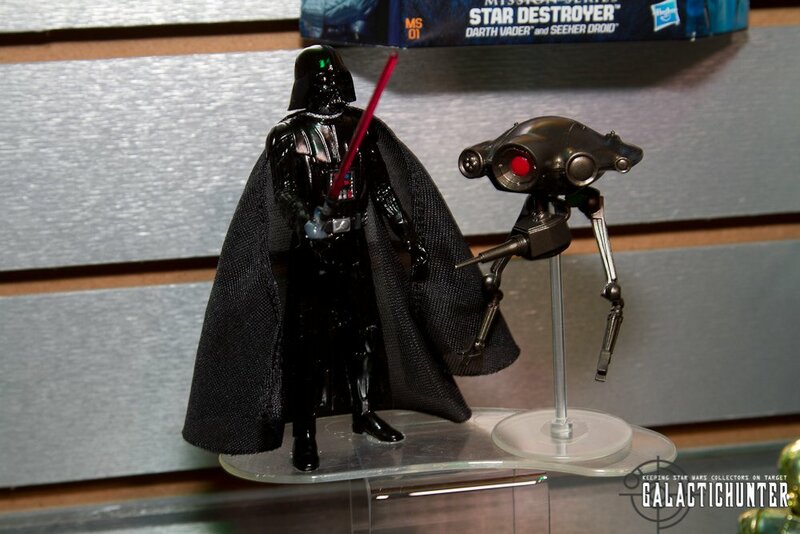 The first wave includes a Darth Vader with Seeker Droid, Jango Fett and a Red Geonosis Battle Droid (they had a tan version on display, 212th Clone and Battle Droid, and a 501st Clone and Battle Droid. Again, these are not supposed to be meant for you, but there's a good chance a few of you are going to like their retro toyetic simplicity. These aren't fancy, and for $10, they're cheap. Hasbro leaves the expensive, highly detailed Sixth Scale figures for Sideshow and produces these 5 point of articulation figures that they're hoping will attract kids just wanting to play and bash them around. Remember when you were 8 years old and wouldn't have to worry about keeping figures as pristine as possible and would even throw them as projectiles? Yup, cheap and somewhat disposable. It's a toy. Anakin and Clone Trooper are out now and Obi-Wan and Darth Vader will be hitting stores in the fall. The early reveals didn't really justify how awesome a toy this is (sponsored by Duracell according to the signage), but it was the demo centerpiece of the Star Wars section and you can see why it won best action figure at the U.K. Toy Fair. Start off with Anakin Skywalker and push a button to activate some Hayden Christensen voiced lines from Revenge of the Sith and the lightsaber lights up blue. 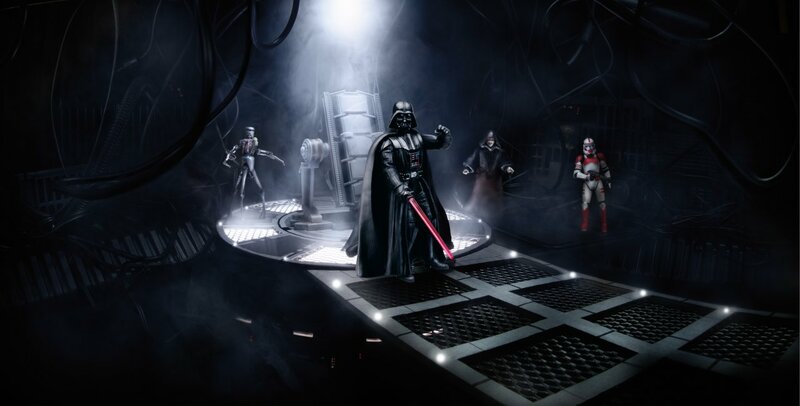 Easily snap on Vader's armor and the voice transforms to the Dark Lord of the Sith and lightsaber turns red. It's a really amazing toy at a low enough price point that should attract a lot of young ones. 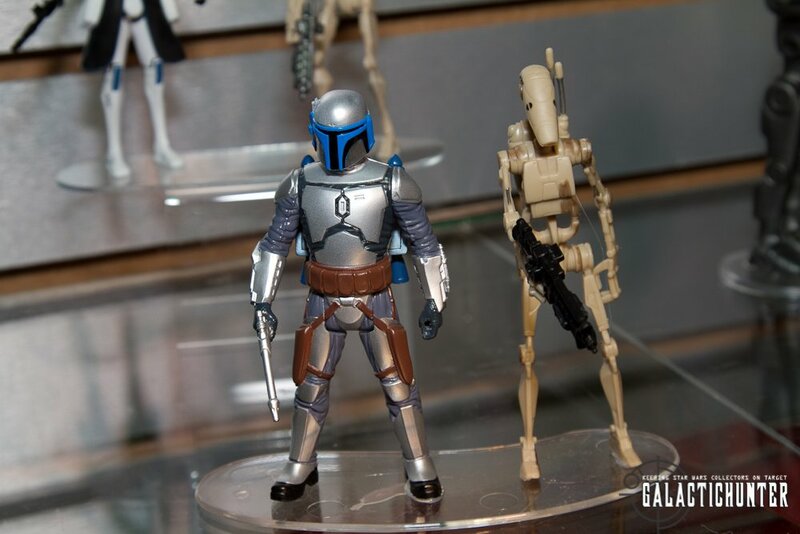 These were revealed at Celebration VI with mixed reaction towards the down-sized scale. Besides the scale, the plastic in some parts are hollowed out and they're really light in weight. At a $20 price point, Hasbro is hoping that they won't break the bank for parents and kids, because you can essentially buy a Saga Legends figure and a Vehicle for under thirty bucks. 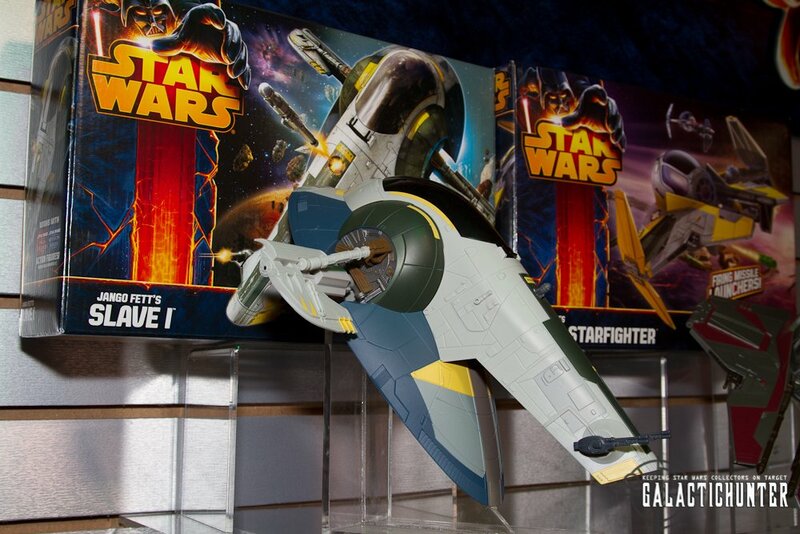 Jango's Slave I, the Republic Tank, and Obi-Wan's Episode II Fighter are in stores now. 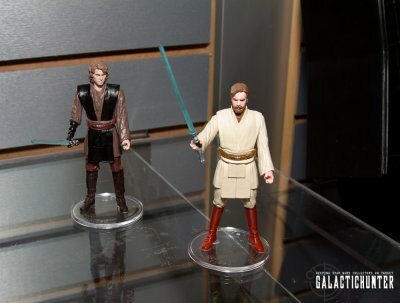 Obi-Wan and Anakin's Episode III Jedi Starfighters are scheduled for the next wave. Are traditionally scaled Class II vehicles now out of the picture? For 2013, adult collectors can get their vehicle fix through some really awesome exclusives. The Vintage Collection is still with us, at least for exclusives (and the re-released "best of" figures scheduled for spring…we think). Amazon has entered the exclusives game with some pretty amazing pieces, but collectors have some apprehension because their packaging and shipment leaves a lot to be desired, and many collect packaging condition with The Vintage Collection. Boba Fett's Slave I that was teased at Celebration VI will be an Amazon exclusive, The packaging looks sublime, though we wished it included the mustachioed Bespin Guard that's still on our Vintage Kenner yet to be made wishlist. The Slave I will come with a Han in Carbonite Block. 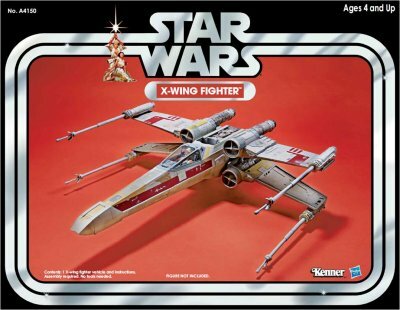 A Vintage packaged TIE Interceptor will also be offered by Amazon. Again, there are concerns due to Amazon's history of horrible packaging, but Hasbro told us they will pass on the feedback. ToysRUs will also be offering Vintage Collection packaged vehicles. The Republic Gunship is finally re-issued and includes the ball turret attachments and three pack in figures (Yoda and an Episode II Clone Pilot and Clone Trooper). Being that it's TRU, don't be surprised if this is priced at $100 or more. A Vintage boxed Biggs Darklighter X-Wing will also be a TRU exclusive and should go nicely with the new Black Series Biggs Pilot that's slated for release in the fall. 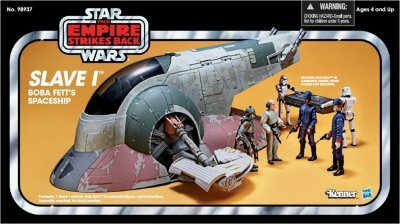 K-Mart continues their Star Wars Vintage Collection exclusive multipacks with an Ewok Catapult with two Ewoks and an Imperial Scanning Crew 2 pack. Hasbro was also supposed to preview a slide featuring their new Disney Star Tours exclusives, but wasn't included in the presentation. 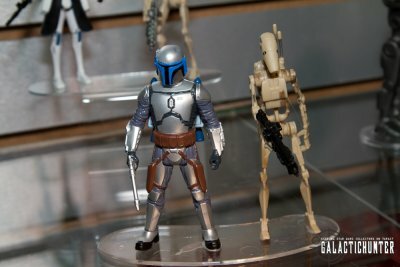 Finally, although Hasbro teased it at the presentation, we have "unofficial" word that the 2013 San Diego Comic-Con exclusive will be a Black Series 6 inch Boba Fett and Han Carbonite. Boba Fett will be the general release figure and the exclusive to the show will be the Han Carbonite, and of course, the packaging. CLICK HERE TO VIEW ALL THE PHOTOS IN OUR IMAGE BANK! 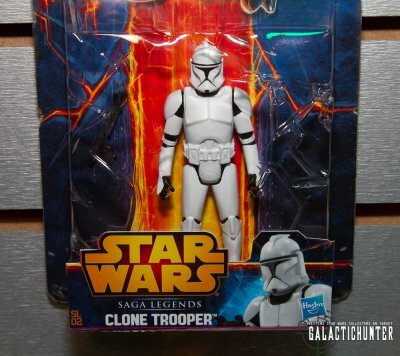 No Final Wave of Clone Wars Figures in U.S. in 2013? Hi, and thanks for the terrific coverage of U.S. Toy Fair 2013. 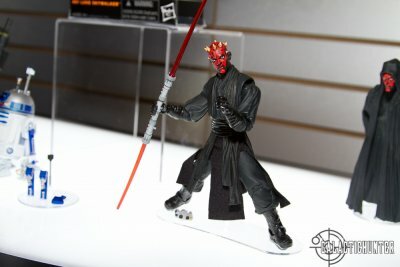 Just a question regarding your statement that the "final wave" of Clone Wars figures would *not* be distributed in the U.S. this year. Could you please remind us which figures those were? Thanks. Captain Rex, R2-D2, and a501st Jet Pack Trooper. 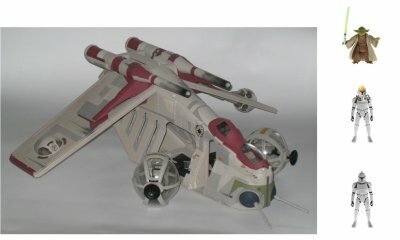 The Rex and R2 were displayed at Toy Fair as part of the Mission Series.